Let’s talk about how we go about remembering stuff with a few simple (and free) tools for the Mac, PC, Web, and iPhone/iPad. How many times a week do you forget your online banking credentials? How often do you find yourself surrounded by scraps of paper covered in scribblings? When last did you actually scan and file notes from your last telephone call or minutes of a meeting? Ever just wanted to jot down a few words in a safe place as you think of them? How do you remember the list of items you need to discuss with Joe when next you meet? Everything I write gets stored in one or more text files. You’d typically open such files in TextEdit or Notepad. As of today, my notes directory contains 433 .txt files. This gives me the freedom to open access my notes in any application I choose and the peace-of-mind of not being tied to a single piece of software. This is where the magic happens. What we want in a note-taking application is the ability to quickly and efficiently search for information. I’d like to introduce you to two applications: NotationalVelocity (for Mac) and ResophNotes (for Windows). NotationalVelocity was developed in 2002 by software developer, Zachary Schneiro to solve his problem of tracking short, unrelated snippets of information. Resoph is a great alternative for Windows users that works in a similar way. The Text field has the uncanny (and awesome) ability to both search and create notes. 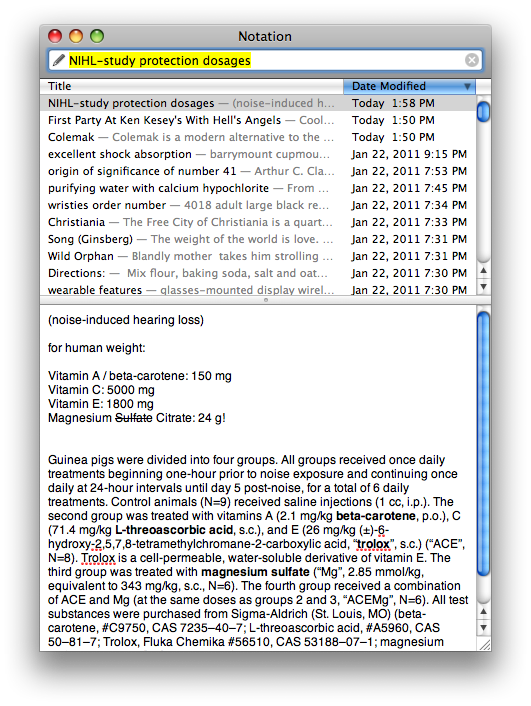 As you type, a full-text, incremental, live search is done across all of your notes. That is, within both the filename and file contents. If you hit Return (or Enter) at any point, you generate a new note with its title set to whatever you just typed. From there, the cursor is automatically moved to the third area - the note editor, and you just start typing your note. It feels incredibly natural. The list of notes shows every note in your notes directory - along with a preview of their contents and date last modified. As you search, this list will update in realtime to show matching notes. Notational and Resoph also save automatically as you type, so you’ll never lose a note again. But what use is a folder of notes on one computer? We need to get our notes onto “the cloud” for safe keeping and easy access. Enter SimpleNote. SimpleNote is an online note-syncing service that automatically syncs with NotationalVelocity and ResophNotes. Simply sign-up for a free account and give Notational or Resoph your username and password. In next to no time, you’ll have access to your notes offline and online. And it get’s better: If you have a iPhone, iPad or iPod Touch, you can download the SimpleNote iOS app (again, for free) and have access to all of your notes - complete with searching and tagging. This is great for note-taking during meetings, conferences and calls. So, go and get that set up and let me know how it goes. I’ll post some power-user tips in the coming days.